This title was first published in 2001. Drawing on the fields of labour economics and industrial relations, this book simultaneously applies human capital theory and institutional analysis to an explanation of occupational and other wage differentials. This outstanding study contains a wealth of reference material on both the economic and normative determinants of wages. Destined to become a landmark study in the area of Australian wage determination, the book is an essential text for labour economists, industrial relations specialists, researchers and policy makers alike. Contents: Reflections on wage theory; Human capital model: a theoretical overview; Wages in practice: wage fixing in Australia; Human capital and earnings: a review of the literature; Determinants of male relative earnings; Determinants of female relative earnings; Equitable comparisons and spillover forces in wage determination; Summary and conclusion; Bibliography; Appendices; Index. 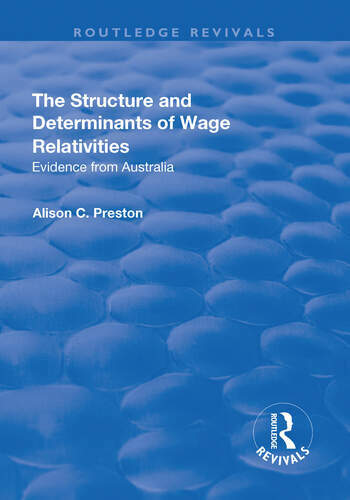 Alison C. Preston is Co-director, Women's Economic Policy Analysis Unit, Curtin Business School, Curtin University of Technology, Perth, Australia and Co-editor of the Australian Journal of Labour Economics.